Verizon Enterprise Solutions is pursuing a new service model for cloud services under which it will encourage multi-cloud hybrid architectures while offering a variety of services tiers, onboarding and workload migration services to encourage help enterprises to migrate business critical workloads. 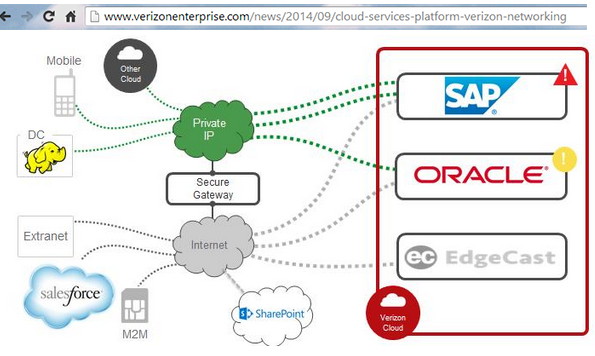 Verizon promises seamless integration with third-party cloud services. It will offer several deployment options ranging from public cloud to private on-premise cloud. At the centerpiece of the strategy is its own Verizon Cloud, which is tightly bound with network and security capabilities. A unified user console will tie multiple cloud services together. Verizon's MPLS-based Secure Cloud Interconnect (SCI) provides Private IP access to major cloud service providers, including just announced connectivity to AWS. In a Verizon blog, Kevin King describes this as a "Workload-Driven Approach to the Cloud". 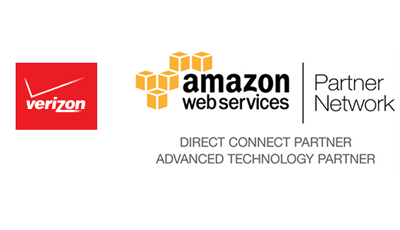 Verizon Enterprise Solutions added Amazon Web Services (AWS) to its growing list of cloud services accessible via its Secure Cloud Interconnect (SCI) service, which runs over Verizon's MPLS-based Private IP network. Verizon SCI lets customers manage a multi-cloud environment with dynamic bandwidth allocation, application performance throughput, quality of service and usage-based billing. Ericsson is introducing a software model for adding features to networks of its mobile operator customers on a recurring basis. The idea is to continually improve the performance and capabilities of mobile networks through periodic software releases. Operator customers would pay on a software model similar to the IT industry, with major releases twice per year. At an industry analyst event in Silicon Valley, Ericsson executives introduced Software Release 15A, the first installment of the new model, featuring packages such as HD Voice, multi-carrier mobility and load management. Altogether, this release includes 150 new features and capabilities for improving the user experience of a mobile network. Ericsson Cloud Execution Environment 15A is based on OpenStack providing openness for third party applications and hardware. It focuses on a high level of resiliency through a triplicated cloud infrastructure controller and efficient infrastructure O&M. Modem Assisted Service Classification which enables the monetization of single or multiple app bundles by dynamic, real-time service classification and policy enforcement. Johan Wibergh, Head of Segment Networks, Ericsson, says: "This is a logical evolution in the shift toward virtualization. Our new model builds on the software performance benefits by making it simpler and faster for operators to implement the packages that best address their business needs. Networks can do much more today and their speed of evolution will only increase." T-Mobile US has awarded a major contract to Ericsson to continue expanding its nationwide 4G LTE network, improve in-building, highway and rural performance, and expand the availability of high-quality VoLTE services. Financial terms were not disclosed. The contract, which is an expansion of T-Mobile's 2012 network transformation project with Ericsson, includes RBS 6000 base station equipment, installation and integration of 700,1900 and 1700/2100 MHz LTE-Advanced radio sites and tuning services. T-Mobile is the first U.S. wireless carrier to deploy enhanced Single Radio Voice Call Continuity (eSRVCC) technology, which enables a seamless handover of VoLTE calls in LTE to existing 2G or 3G networks. Ericsson has delivered its Session Border Gateway (SBG) and Ericsson Media Resource System (MRS) to support voice handovers using eSRVCC. Ericsson has enabled Wi-Fi calling through its evolved Packet Data Gateway (ePDG)1 and interoperates with T-Mobile's existing IP Multimedia System and Evolved Packet Core network infrastructure.Additionally, Ericsson's Services organization will help T-Mobile achieve OPEX reduction through the decommissioning of MetroPCS sites and ecological repurposing or recycling of removed site material. Neville Ray, CTO of T-Mobile US, says: "We are constantly working to enhance and grow our network for our customers. 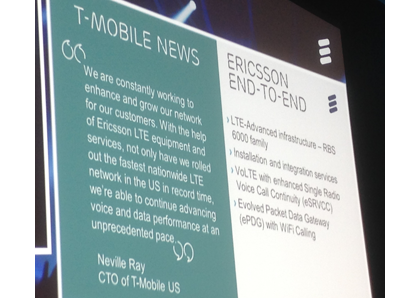 With the help of Ericsson LTE equipment and services, not only have we rolled out the fastest nationwide LTE network in the US in record time, we're able to continue advancing voice and data performance at an unprecedented pace." 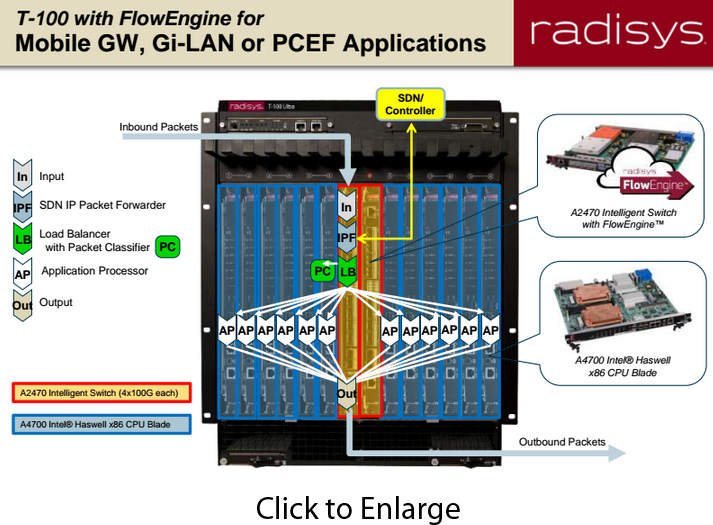 Radisys introduced its T-100 platform featuring new "FlowEngine" data plane software and optimized for high performance SDN and data plane Network Functions Virtualization (NFV) processing requirements. Significantly, the new T-100 Platforms, which are based on commercial off-the-shelf (COTS) silicon, can support multiple 100G ingress ports, while classifying, switching and load-balancing traffic to the latest Intel Xeon-based processing blades for performing virtual network functions. Radisys said the new T-100 Platform with A2470 switches, populated with A4700 resource blades running Intel Data Plane Development Kit (DPDK), is an ideal NFV data plane processing platform for Layer 5-7 DPI applications, Policy Control Enforcement Functions (PCRF), or Gi-LAN application processing requirements. For NFV, the Radisys T-100 is designed to maximize use of open source and standards such as RedHat and Ubuntu KVM. It can be managed from an orchestration layer via NF-Vi interfaces. It supports OpenStack Nova (Compute) and OpenStack Neutron (Network). Earlier this month, Radisys announced support for the new Intel Xeon E5 2600 v3 series processors with performance upgrades across its broad x86 product portfolio. 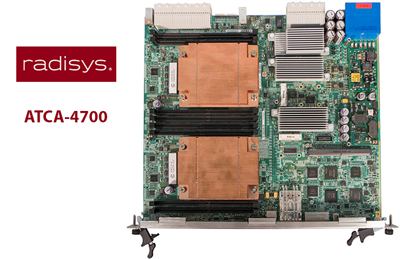 A new, standards-based ATCA-4700 blade for the Radisys T-Series Ultra and Pro and the latest Radisys T-Series Compact Rackmount Server are based on the new Intel Xeon E5 2600 v3 series processor. Radisys said the performance boost makes these solutions well suited for SDN and NFV applications. Carrier-scale deployment of SDN and NFV will require platforms that can process hundreds of millions of data plane flows simultaneously, across thousands of Virtualized Network Functions (VNFs). Radisys also noted Intel Data Plane Developer Kit (Intel DPDK) optimizations and support across its x86 product line to ensure customers get the best performance possible. In addition, Radisys brings solutions and expertise in LTE, Deep Packet Inspection (DPI) and security to its broad range of applications. The combination of telecom-grade performance and a broad product portfolio optimized with Intel DPDK allows TEMs to focus resources on rapid innovation in the virtualized application arena. 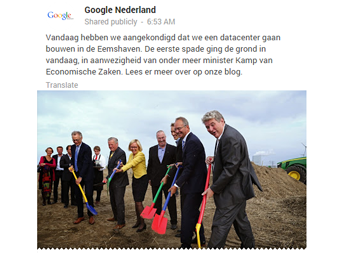 Google held a ground breaking ceremony with Dutch officials to launch construction of a huge data center in Eemshaven, Netherlands -- its fourth mega data center in Europe. Other sites are Dublin, Hamina (Finland) and the Belgian St. Ghislain. The data center is expected to enter service in late 2016 and be fully operational in 2017. Foofle said its plans to invest EUR 600 million in the project. 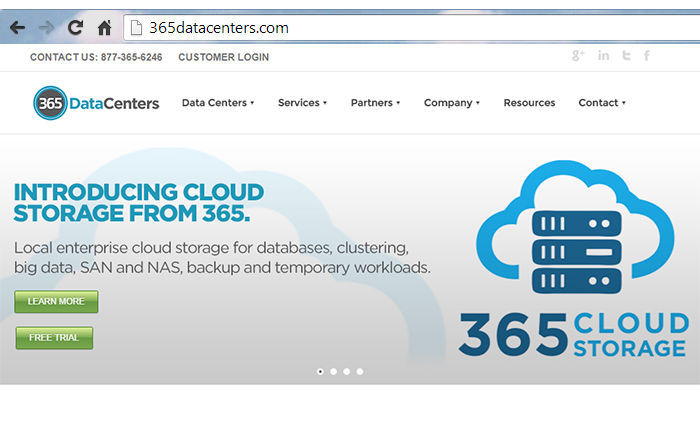 365 Data Centers introduced a local, enterprise cloud storage-as-service (STaaS) across 17 U.S. markets. The service is geared for applications such as clustered databases, big-data analytics, file storage, archiving, storage migration, backup, remote disaster recovery and temporary workloads. 365 Cloud Storage provides enterprise-class security and controls, self-service provisioning, high security and pay-for-use pricing. Some additional features include selection of dedicated SATA, SAS and SSD drives; support for both SAN block storage and NAS file storage (NFS/SMB), and 10Gbps and 1Gbps private network access via cross connect or metro fiber. "Businesses continue to struggle with the non-stop growth and management of storage. It is costly and risky to buy dedicated storage. Public cloud providers have been unable to crack the enterprise cloud storage market because it requires businesses to move both applications and data into the cloud," said Keao Caindec, CMO, 365 Data Centers. "365 is bringing the cloud to 17 local markets. We believe businesses should be able to connect their enterprise applications and servers to local on-demand storage to support development, testing, QA and production environments securely. We enable our clients to reduce the risk associated with purchasing dedicated physical storage infrastructure while avoiding large upfront capital expenditures and dramatically reducing total cost of ownership." The majority of DDoS attacks are short in duration and repeated frequently, according to a newly issued 2014 Mid-Year Threat Report from NSFOCUS, which specializes in distributed denial of service (DDoS) mitigation solutions. However, the number of high-volume and high-rate DDoS attacks continued to rise in the first half of 2014 as well. The report drew on statistical analysis of actual DDoS attacks. Attacks continue to be short in duration with repeated frequency: More than 90 percent of attacks detected lasted less than 30 minutes. This ongoing trend indicates that latency-sensitive websites, such as online gaming, eCommerce and hosting service should be prepared to implement security solutions that support rapid response. High-rate, high-volume attacks increased: DDoS traffic volume was up overall with a third peaking at over 500Mbps and more than five percent reaching up to 4Gbps. In addition, findings showed that over 50% DDoS attacks were above 0.2Mpps in the first half of 2014, increasing from around 16%. And over 2% of DDoS attacks were launched at a rate of over 3.2Mpps. Top three DDoS attack methods revealed: HTTP Flood, TCP Flood and DNS Flood were the top three attack types, together making up 84.6 percent of all attacks. DNS Flood attacks held their place as the most popular attack method, accounting for 42 percent of all attacks. While the number of DNS and HTTP Flood attacks decreased, TCP Flood attacks grew substantially. Increase in ISPs, enterprises and online gaming targets: Attacks targeting ISPs increased by 87.2 percent, enterprises by 100.5 percent and online gaming by 60 percent. Longest, largest and highest-frequency attacks: The longest single attack lasted nine days and 11 hours, or 228 hours, while the single largest attack in terms of packet-per-second (pps) hit at a volume of 23 million pps. More than 42 percent of attack victims were targeted multiple times while one in every 40 victims was repeatedly hit more than 10 times. The highest frequency of attacks experienced by a single victim was 68 separate DDoS attacks. “NSFOCUS has maintained a continuous review of DDoS attacks over recent years, and we have observed that the trends constantly change as attacks morph and hacker behavior evolves. To stay ahead of these trends, we strongly encourage our customers to take a defensive approach in identifying and mitigating these threats before they happen,” stated Terence Chong, Solutions Architect, NSFOCUS.